The gates open to the first Carnival of Homeschooling. As guests excitedly move into the park, several stop at the Information Booth with questions. David from Australia at Bruggie Tales answers, Why people homeschool? Christina of Routon Family Homeschool reports on the status of homeschooling in the United States. Rivendell, WIS has a history of homeschooling. Every year more people join the homeschooling parade. Chris of O'Donnell Web has some advice for fathers who are homeschooling for the first time. Laurie Bluedorn (who with her husband wrote Ancient history from primary sources) of Trivium Pursuit offers guidance for parents faced with adult peer pressure. Jane of IndianaJane's Homeschool Notebook shares her experience as a new homeschooler. At The Imperfect Homeschooler Barbara Frank (who wrote Life Prep for Homeschooled Teenagers) responds to a friends comment that "some homeschoolers raise their daughters to be homemakers and their sons to be senators." At the first booth, we see the Juggler. Melissa Wiley (author of The Martha Years books and The Charlotte Years) at Here in the Bonny Glen explains why homeschooling actually makes her challenges easier and more fun to juggle. At the next booth, we have Games of Chance. Patricia of Patricia Ann's Pollywog Creek Porch describes an amazing, spontaneous homeschool moment. The following booth is The Fortune Teller. Mental Multivitamin makes predictions about the future of learning. In our last booth, the Splash Zone, Amber of Trying is Bravery tells about a family outing, opps, I mean field trip. Next, we wander in to see the Lion Tamers, those brave homeschoolers who take on the question of socialization. Robert Lindsey of Biblical Parenting muses about the complaint of homeschool children not being socialized properly. Kim at Life in a Shoe explores myths about socialization. Headmistress in The Common Room provides some questions to ask about socialization. Before exploring more of the carnival, let's stop at The Food Court. Janine Cate at Why Homeschool eagerly shares her experience as a customer at the Cate Cafe. Joanne, The Happy Homeschooler, explains the Bean Dip Strategy for dealing with hostility towards homeschooling. Now, on to the Fun House. Allison Tannery at Geronimo! shares some of the joys of homeschooling. Tami covers her typical homeschool day. Shana Hickamn (Publisher of Live Free Learn Free) at Live Free Learn Free contributes an Unschool-at-Home Day. Mary Jo Tate on Eclectic Bibliophile points out the danger of thinking that learning only happens at a specific place and time. At our carnival, traveling preachers share their faith and inspiration with the crowd. Anne of Palmtree Pundit has found a theme for the new year, "for all endurance and patience with joy." Kim Anderson at Mother-Lode reveals a pattern for teaching and training children. Ann Voskamp of Holy Experience asks and answers, How would Jesus Homeschool? Spunky of SpunkyHomeSchool ponders her role in the Christian Homeschooling Movement. Cindy Downes lists 16 mistakes homeschool mom's make. Now on to the bumper cars. There's some contention or conflict in any important issue. Columnist Doug Powers playfully points out how homeschooling could save the environment. Michael Hardt of Family School explains that homeschooling is a teacher's nightmare or a teacher's dream. Daniel Macintyre of Key Words has a response to the NEA's article, Home Schools Run By Well-Meaning Amateurs. Before leaving our Carnival of Homeschooling, don't forget to stop at the Lost and Found. Joanne at A Day in Our Lives shares the benefits of Homeschooling when Adopting an Older Child. Thank you for visiting the first Carnival of Homeschooling. We hope you have enjoyed it. Next week the carnival will be held On the Company Porch. If you are intertested in submitting a post, click here. 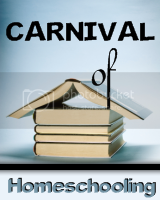 If you have enjoyed the first Carnival of Homeschooling, please spread the word. If you have some constructive suggestions on how to improve this carnival, please leave a comment. And lastly, I'd like to thank everyone who has helped out. In trying to get this started over the Christmas Holidays I was expecting a slow start. But dozens of people spread the word, many bloggers I've never heard of found out about the Carnival of Homeschooling, and posted on their blog encouraging people to submit postings. Thank you. Fabulous! Way to get us off to an awesome start. A wonderfully creative carnival! Great job! Thank you Henry! You did such a great job getting all of this together. Thanks for the time and effort to do this1 Now I need to find some time to read these!!! This is a fantastic show you have going. What a great start! I heard about the carnival from Indiana Jane and had to come and see what it was all about. Nice way to learn what other bloggers have to offer. Great compilation -- I can't wait for the next carnival! What a cool event! I enjoyed browsing through the carnival and now intend to walk back through and visit each booth at my leisure! You did a great job starting this up! What an interesting concept. I'm definitely going to spread the word. Homeschooling isn't as difficult as it used to be when access to the Internet and online schools were unheard of.